TO MY KNOWLEDGE my sister (Mrs. A. Young) and I are two of the oldest members of the present membership, with no break whatever in our attendance and membership. We left England with our parents and landed in South Australia in June, 1912, and came to Kurri Kurri during December, 1912. My father having come on a few weeks ahead to find work on the coal-fields, landed at Weston and, being an accredited local preacher with quite a few years experience in England, had taken services at Weston and Kurri Kurri before we arrived. Weston and Kurri Kurri at that time were in the one Circuit under the Ministry of Rev. H.B. Hobson, the previous Minister being Rev. Sharkey. Coming from England, we were used to walking, as we often went for long walks in the twilight. It served me in good stead as I remember walking to Neath with my father and mother, for him to take the evening service; to Abermain quite often, and to Weston just as an evening's stroll from where I live now. Pelaw Main and Hedden Greta were also taken in our stride. Now we think twice of going to service if there is no transport available. I honour and revere the memory of my father (A.E. Barkwill) and the other preachers of the Kurri Kurri-Weston preaching plan in those days; they were men of substance who truly walked with God and for Him. Of course I know there were other circuits with Godly men, who walked even further to preach the word of God, but I am trying to show how solid were the foundations of Methodism in the Kurri Circuit. I am proud that I was able to just walk beside him. One of my greatest experiences with our Church was becoming a member of the Mission Band, not a musical group, but a band of young men from 16 years and upwards, imbued with spiritual fervour, willing to conquer any evil this world had to offer. Most of the names will be remembered by quite a number of folk who may read this; A. Young, Joe Stewart (decd), Arch Turnbull (decd), Will Jackson (decd), Andrew Hyslop, G. Herron, Lawrence Butcher. Each one was coupled with a local preacher and went to his appointments with him, and gave out hymns and read the lessons, a great experience for a young man. During this time we. were afflicted with, the "flu" epidemic; the aftermath of the First World War. The Churches and all places of amusement were closed for a period. The Mission Band still has their services; not in the Church, but under blue skies in the open bush. These happenings were during the ministry of Revd Ingram Pearson, who proved to be a big help, and very understanding towards us. About this time, the youth of the Church decided to build a Tennis Court, and the Trust kindly made us an offer of the empty block of ground where the present Church now stands. Having no money to build it ourselves, it was here I got my first introduction to the “working bee”. We were very enthusiastic, but very inexperienced. We started with mattocks, spades, shovels, and barrows. We had just started making an impression on levelling the site when the Trust decided to build the present Church on the block they had just given us You can imagine the popularity of that noble body of men (the Trust). However, we take our hats off to their wisdom, and they were good enough to give us a block on the other side of the Hall (which was the Church then), and had it brought up to the same condition as the block we were working. After a lot of starts and stops, we eventually built a tennis court, which was used by the young folk for many years. I have a snapshot taken on 13.9.21 at the scene of operation on our first location; the faithful few, G. Herron, A. Hyslop, T. Street (decd), W. Jackson (decd). J. Hestelow (decd) and myself, taken by S.P. Jacobs. Another helper, not in the picture but a tower of strength was the late Roy Bagnall. Of course, behind the working bee there were quite a number of lady helpers, altogether a happy, healthy band of young people. The Church was blessed with an abundance of youth during this period. This was my first working bee for the Church, but I have been in plenty since, and all for a worthy cause. As a Church we have never been too financial, and as a result our buildings have suffered. Painting was a dire necessity and buildings needed constant attention to keep up the appearances and for preservation. Our Church may not look the best in town, but it is still the place where we worship, and be it ever so humble there's no place like home. 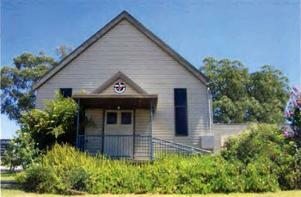 I am now a member of the Kurri Kurri Church Trust, a job one can't hold lightly; we have proved in the past that we can weld ourselves into a united effort and have accomplished quite a lot of projects trying to preserve church properties. I hope I may be spared a little longer to work side by side with my fellow Trustees, doing the work at hand in the Master's service. I derived great happiness and inspiration from my association with the choirs of the church, starting at an early age in the Juvenile Choir conducted by Mrs. Sharman. I'm afraid we gave her many heartaches as our thoughts were not always on music. Many of you who sang in the Choir will look back and remember the patience and hard work she put into it so that we would be proficient for the morning service. Just as our present junior choir is doing now, we helped in no mean way to add the beauty of music to our morning service. Then singing in the Adult Choir as a boy contralto under various conductors. I suppose there are quite a lot who will remember the Sunday School Picnics we used to have at the old Heddon Greta racecourse. Quite a red letter day for our Sunday school, catching the train at Stanford Merthyr railway station and dropping us at the racecourse. The grandstands were very useful and convenient for our picnic dinner and tea, shelter from rain and sun, and ample grounds to play in for the young folk. A must for the real agile young fry was a trot around the race track (about 1 mile) after which we could settle down and enjoy the various races and rounders game. Catch the train home to Stanford Merthyr after spending a wonderful day. Something to remember. Sunday School Anniversaries were something special in those days. The town had some wonderful singing from the various Anniversaries and the Methodists were second to none. Many of our artists on the concert platform made their debut at the S.S.A. Thank you, June and Nell for the opportunity to bring back memories of what the Church meant to us in the GOOD old days.